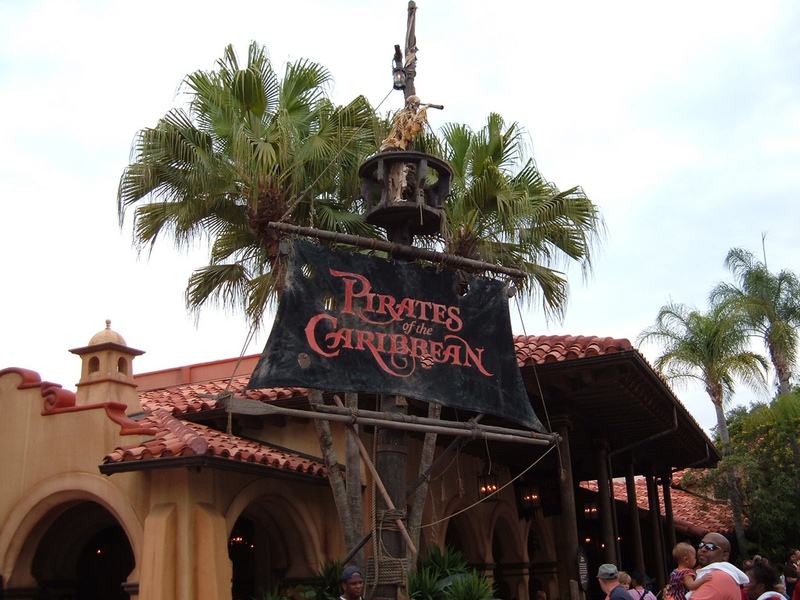 Originally, there was a scene on the ride where various women are taken prisoner and then auctioned off, with an ensemble of drunken pirates shouting that they want a curvy woman with ginger-colored hair instead of the fat maid currently being auctioned: “We wants the redhead!” they cried. This year, however, the scene underwent a massive restructuring. Gone were the captive women; now it was chickens being auctioned off, as though seafaring pirates had a sudden desire to become landlubber farmers. More noticeably, the “redhead” was no longer a captive but instead a commanding pirate captain. Gone was the weak and oppressed woman! What makes this particular edit even more tonally inconsistent is the scene afterwards, where pirates chase after maids and other servile women in circles. This was not changed and heavily contrasts with the admittedly feminist scene preceding it. I wondered, “Why would pirates treat this one particular woman with respect when they lustfully chase after others? I conducted research when I arrived at my hotel suite later that day and found that female pirates did exist, but were nowhere near as powerful as the men. One of the most notable and best-recorded female pirates was Anne Bonny, but even she rose to power by becoming the lover of a male pirate, John Rackham, and dressed as a man when in combat. Therefore, I was even more befuddled as to why Disney would portray not only a female pirate, but a female pirate captain, when even one of the most famous female pirates didn’t take that position. Then I realized why most likely the scene was changed. The scene where women were auctioned against their will to pirates might have drawn criticism for sexist overtones. Instead, Disney not only removed the scene but created a new, empowering female figure to avoid controversy. Granted, “Pirates of the Caribbean” is hardly an accurate historical representation, but nonetheless the progressive change simply did not make sense in context. I found this decision to alter history in order to appeal to a certain viewpoint to be eerily reminiscent of George Orwell’s novel “1984.” The book is about an extreme right socialist movement, led by the fictional Ingsoc party, that took over Britain and created a Stalinist dictatorship under which any dissidents are immediately eliminated. Part of Ingsoc’s totalitarian plan includes “Newspeak,” language that includes the erasure of any records and materials that contradict the party’s teachings. Ingsoc replaces historical records with its own accounts to avoid triggering a resistance movement, similar to how Disney replaced the auction scene with a commanding female pirate to “turn the page,” as one spokesperson said, on an unsightly chapter of the past. In both cases, history is distorted and changed to fit a specific narrative. The issue of censoring or destroying distasteful and offensive materials has always been a controversial topic. One of the more infamous cases of this controversy is Mark Twain’s “Adventures of Huckleberry Finn,” a book that uses pejorative racial epithets while highlighting the horrors of racism. The book is undeniably anti-racist — Jim, one of the book’s protagonists, is a refugee slave who is arguably the most noble figure in the book. The other protagonists are willing to sacrifice to protect Jim, which promotes the concept of fighting against racism. Yet, because Twain chose to use racial epithets to represent the racism of his time, the book has been censored repeatedly and is one of the most challenged texts in public schools due to its usage of racial slurs, even though the usage is historically accurate. The desire to eliminate offensive material is understandable, especially in today’s progressive and egalitarian society. Yet, we should not be so quick to follow Ingsoc’s model and eliminate and replace parts of the past that we now deem unsuitable. Rather than stamping them out, we should keep them to learn what we shouldn’t do. If we truly desire to prevent future offenses, we need to study how we erred in the past. From “Adventures of Huckleberry Finn” we can learn how casual racism played a part in daily communications and understand that we must eliminate it in modern jargon. Likewise, from “Pirates of the Caribbean’s” auction scene, we can learn how women were treated in the past and realize that we must avoid replicating such abuse today. If we totally eliminate such “inappropriate” material, we lose these learning experiences. It is unfortunate that people find so many aspects of history and media offensive, especially when studying those aspects can help avoid future transgressions. Destroying those aspects and replacing them with material that fits into modern society’s definition of what is “appropriate” must be avoided.